The Officiant Guy, Chris Robinson, is a very popular wedding officiant for weddings. Peruse through this wedding officiant’s website to see why. Chris has performed practically every kind of marriage ceremony. He is eloquent, intelligent, witty, and at ease in interviews and on camera. Chris is also a specialized notary commissioned by Los Angeles county to issue confidential marriage licenses and an attorney so he is able to discuss the legalities of marriage. 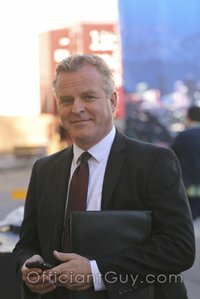 Chris is not an actor, but he has been called upon by so many TV shows to appear that he is very comfortable speaking in front of hundreds of people or on camera in one take. For media inquiries contact Chris Robinson at OffcntGuy@aol.com or (562) 547-3255 or (310) 882-5039 for all kinds of wedding information. Chris Robinson, Officiant Guy on the set of KTLA. 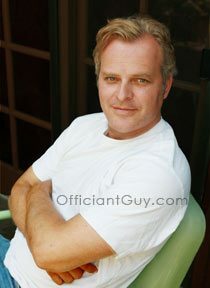 Officiant Guy is a California wedding officiant for weddings. He has been marrying couples and delivering LA County confidential marriage licenses for over several decades. Chris will be able to perform any type of wedding ceremony from a secular wedding ceremony to a non secular wedding ceremony with possible additions from ceremonies to handfasting ceremonies. If you wish to get married anywhere in Southern CA give the premiere wedding minister in Los Angeles a phone call at (310) 882-5039 or (562) 547-3255 or fill out the contact form.